Some ethnicities have nasal characteristics that are unique to each race. It is typical for people of all races to want a change of appearance in their nose without diminishing their cultural background or heritage. Everyone wants a symmetrical, pleasing looking nose that fits their face and skin type regardless of creed or nationality. 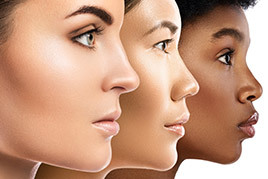 There are unique characteristics of African American, Hispanic, Middle Eastern, or Asian noses that determine the unique approach and techniques. 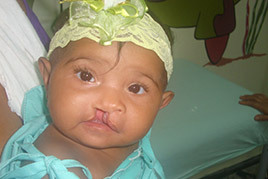 Rhinoplasty (nose surgery) is the number one requested surgical procedure by teenagers. Embarrassment, awkwardness, and unworthiness may be attributed to their most distinct facial feature—their nose. Rhinoplasty may be a solution; but your first steps should be to get educated about why your teen wants the procedure, what is involved, and who can perform it. An ultrasonic rhinoplasty is a minimally-invasive procedure that can be performed in under 30 minutes with local or twilight anesthesia and offers a greatly reduced recovery period. It is a great procedure that is most often used to remove excess bone and cartilage, often referred to as a “hump” or “bump” on the bridge of the nose. Each year, one hundred thousand men and woman undergo blepharoplasty, or eyelid lift, to improve the way they look. Droopy upper eyelids are the results of excess sagging eyelid skin,and can make you look older and impair vision. The lower eyelids become puffy and bags develop with age due to prolapse of fat underneath the eyes. These changes often contribute to a worn and tired look. This procedure cannot alter fine wrinkles around the eyes nor sagging eyebrows. Ready for a facelift? Learn all about facelift procedures and why double board certified New York facial plastic surgeon Dr. Andrew Jacono is rated as the best facelift surgeon. In his facelift surgery Doctor Jacono minimizes any visible scars and creates a natural rejuvenated look. He has performed thousands of facelifts and has never performed the exact same surgery twice. Mini Face Lift is a revolutionary procedure that can be executed to minimize downtimes and can be performed under local anesthesia with no general anesthesia. As the years go by, aging of the face is inevitable. The skin begins to loosen in the face and the neck giving way to “crow’s feet” at the corner of the eyes, jowling at the jawline, deep folds or “marionette lines” at the corner of the mouth, and vertical folds and a “double chin” beneath the chin. Heredity, sun exposure, the pull of gravity, and personal habits such as smoking contribute to the aging of the face. This changes are best treated with a face lift. Over the course of almost two decades, Dr. Andrew Jacono has developed and pioneered the most advanced and comprehensive deep plane facelift that helps create natural results lifting drooping cheeks, jawline and neck without the appearance of the stigmata of tightness that can occur with other facelifting techniques. A short scar facelift is a surgical procedure that Dr. Jacono performs on patients who are looking to rejuvenate primarily the lower face, and jowls. There are many different facelift techniques available and some are more sophisticated than others. The vertical facelift is the most effective technique to rejuvenate aging changes that are most noticeable around the mouth or perioral region, i.e. drooping cheeks, nasolabial folds or smile lines (between the corner of the nose and corner of the mouth), marionette lines and jowls. SMAS is an acronym for the superficial musculoaponeurotic system which is a layer of fibrous tissues and muscles that start just in front of and below the ear extending down to the neck. This thin yet strong layer covers and connects the muscles and structures of the face, the midface, and the neck together as a continuous fibromuscular tissue. A lower facelift is a surgical procedure that Dr. Jacono performs to tighten the loose skin of the jawline and jowls, and drooping “turkey” neck. Learn more about why women in their forties are getting facelift procedures with top facelift surgeon Dr. Andrew Jacono. Dr. Jacono is considered an authority on face-lifting techniques. One of the most frequent questions that facelift patients regularly ask Dr. Jacono is “will I have a visible scar”. So, unless you are doing non-invasive facial rejuvenation like microdermabrasion or chemical peels, you should expect the potential for some scarring to be present. That potential is greatly reduced when you are working with an experienced facial plastic surgeon like Dr. Jacono. Stem Cell facelift is a non-surgical facial rejuvenation process that does not involve surgery at all. Stem Cell Face Lifting is one of the most cutting edge techniques in plastic surgery in the past 30 years. Liquid facelift procedures are non-surgical procedures that involve injecting a combination of facial fillers and neurotoxins to rejuvenate the face and restore a more youthful appearance. Dr. Jacono is a board certified facial plastic surgeon who has been using this non-surgical facelift technique in both his Great Neck and Manhattan locations over the past few years. An African American facelift procedure must be tailored to the specific characteristics of their aging process, and the anatomic differences and difference in skin type that exist in those of African American decedents. Dr. Jacono uses an individualized approach in treating African Americans and their unique facial features. The Asian facelift procedure is a cosmetic surgical procedure that Dr. Jacono performs to reverse the signs of facial aging in his Asian patients. Dr. Jacono understands that the Asian face is different than faces of other ethnicities and requires specialized methods to enhance his patient’s appearances without losing their ethnic identity. As we age ,the muscles of the neck become loose and drop underneath the skin, resulting in what many women and men refer to as a “Turkey Neck”. Vertical banding in the neck may also occur with two paired cords in the middle of the neck due to laxity of the platysma muscle. This is an isolated problem and most surgeons will explain to you that you need a total face and neck lift to correct the problem which is more surgery than most people want. The term platysmaplasty refers to the cosmetic procedure that involves surgical reconstruction of the neck muscles called the platysma. This procedure is performed specifically to rejuvenate both the neck area and under the chin. Many obese people have large round faces and full heavy necks. As morbidly obese people lose weight, their faces lose their youthful fullness- resulting in an older appearance than when they were obese. Today, with the advent of bariatric surgery, it is not uncommon for many patients to lose 100 pounds or more. Weight loss can exacerbate the aging process; the skin becomes loose and saggy as fat decreases, heavy lines appear, and the neck sags giving the person a “turkey neck”. The appearance of heavy lines around the cheeks, beneath the eyes and jowls gives a “St. Bernard look.” Doctor Jacono regularly performs face and neck lifts on those who have taken control of their health and lost the weight. In the quest for better health, Doctor Jacono has noticed these changes in appearance can be somewhat troubling to the person losing weight. Doctor Jacono is one of the most specialized and best facelift plastic surgeons in the world. He has extensive experience in the Facial Plastic Surgery’s latest advanced techniques, and is an innovator in Facelift Surgery and facial rejuvenation. Patients travel from all over the world to Doctor Jacono’s USA Facelift surgery center located in New York City. Dr. Andrew Jacono, is the surgical director of New York Center for Facial Plastic and Laser Surgery, and has been chosen as one of the top rhinoplasty surgeons in the USA and in the world. USA Rhinoplasty Surgeon Dr. Andrew Jacono has developed a customized approach to preserving ethnic identity in rhinoplasty surgery, while achieving natural, beautiful definition and curves in the nose. The liquid facelift is the latest advancement in non-surgical facelift that provides a more youthful and refreshed appearance. It offers many of the benefits of a traditional facelift without having to undergo a surgical procedure and its recovery. Although Doctor Jacono is a Facial Plastic Surgeon he realizes that not everyone wants surgery and today we have options with the many new and wonderful injectable products. Today he performs as many non-surgical liquid facelifts as he does surgical face lifts. As we get older, the brow and forehead are often those areas that show the first signs of aging. Due to the effects of sun and the pull of gravity, the skin begins to sag, resulting in frown lines, wrinkles across the forehead, and increased heaviness of the eyebrows and upper eyelids. These changes contribute to a tired, angry or sad expression that may not reflect the way you feel. Even people in their thirties may have faces that look older than their years. Although Doctor Jacono is a surgeon he understands that not all patients want surgery but still want to look rejuvenated and have skin tightening and rejuvenation of their face. There are non-surgical face lift options that have no downtime and can erase 5 to 10 years off your appearance. As we age the face droops with gravity and also loses the natural volume of youth. This volume creates the apple cheeks we remember from years past. Non-surgical face lifting has been revolutionized in the past 5 years, with facial skin tightening devices and with injectable fillers that add volume back to the face. While Fat Transfers to the face create the longest lasting volume replacement, there are many injectable treatments that do not require harvesting fat and a minor surgical procedure. To deliver the best results he combines Ulthera with Sculptra. Ulthera is the newest most effective facial tightening, and Sculptra is the longest lasting facial injectable treatment that requires no surgery. Kybella® is one of the newest and most innovative injectables available today. As the first and only Food and Drug Administration (FDA) approved to treat submental fat, Kybella® provides unmatched results for eliminating the double chin. Using a series of injections, performed over several sessions, Dr. Jacono can use Kybella® to restore a smooth, sculpted chin, creating a necklift without surgery. Fat Transfer (Fat Injections or Fat Grafting) and Stem Cell Face Lifting is one of the most cutting edge techniques in plastic surgery in the past 30 years. Over this time multiple face lifting procedures have been presented for rejuvenation of the face, most of them stressing the need for extensive surgery. What we have come to realize over this time, is that the face ages not just because of drooping (which would require a face lift) but also because of deflating and losing the natural volume in the cheeks, jawline and under the eyes. Plastic surgeons have been using temporary fillers such as Restylane, Juvederm, Radiesse and Sculptra to add volume back to the face giving it a more youthful, rested and natural appearance. Doctor Jacono specializes in fat transfer revision, fat transfer reversal, facial fat graft removal and facial fat transfer correction. Doctor Jacono performs fat grafting and stem cell facelifts himself and it is a powerful modality to reverse facial aging. 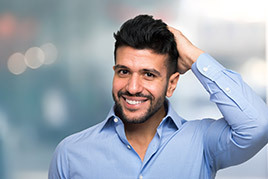 Hairline Lowering surgery, also known as forehead reduction surgery, is a surgical procedure that is performed by Dr. Andrew Jacono to help reduce the appearance of a large forehead or a high hairline. Dr. Jacono is a leading facial plastic surgeon in New York who specializes in surgical and non-surgical procedures to help create natural beauty and facial harmony for his patients. Patients requesting lip augmentation come from all age groups. As we get older the lips age with the rest of the face resulting in atrophy of the lips. The lips thin out, tiny vertical lines appear, and the graceful Cupid’s bow of the upper lip begin to flatten. Others may have been born with thinner lips, and simply want a more defined Cupid’s bow and greater lip volume to balance the other features of their face. Upper lip lift surgery is a lip augmentation procedure that can provide long-term results and avoid the need for lip implants and lip injections. Dr Jacono is one of the Best New York City Plastic Surgeon specializing in natural upper lip lift before and after, using both the bullhorn upper lip lift and Italian lip lift techniques. A well defined facial skeletal structure gives balance to the face and is an integral part of one’s profile. When we look in the mirror, we are more likely to take note of the shape of the nose, ears, and the signs of aging such as jowling and fine lines and wrinkles than the chin and cheeks which are the underlying framework of the face. Facial plastic surgeons such as Doctor Jacono always analyze the face as a whole. Often a weak chin and cheek bone structure can detract from the results of a nose reshaping surgery (rhinoplasty) or facelift surgery. Augmentation of the chin and cheeks is sometimes necessary to achieve facial balance and harmony. Jaw Implants or Jaw / Mandibular Augmentation is most commonly performed to correct a small or aesthetically imbalanced mandible. 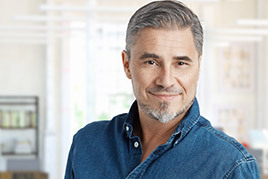 Men who want an even stronger jawline, and have a narrow width to the outer aspects of their jaw by their ears, are candidates for jawline implants. Buccal fat removal is a procedure that involves the removal and/or reduction of the buccal fat pads in the cheek region. This procedure is commonly performed to address full rounded cheeks or chubby cheeks. The results are a more defined and chiseled cheek. The combination of CT scanning and the Computer Aided Design (CAD), Dr. Jacono is able to create bespoke facial implants using precise measurements based on the patient’s own physical model. Each implant is specifically engineered to each patient’s desires and anatomy. Another possibility for improvement with a poorly defined facial structure is Liposuction or a Buccal Fat Removal. Submental liposuction (liposuction under the neck) removes excess fatty tissue to help further define the chin and the neckline. The cheeks can be better defined by performing a Buccal Fat Extraction. Buccal Fat Extraction removes the fat underneath the cheek skeletal structure through a hidden incision inside the mouth. Although this frothy title might suggest an intoxicating mixed drink for a patient who has undergone the knife, these elixirs are not alcoholic. This cocktail is a combination of injectable treatments, which when performed at the same time can provide extremely rejuvenating results. They represent a gentler alternative to a face lift by using plumping fillers and Botox. 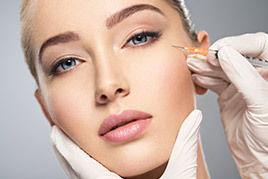 Although their results are temporary and not as dramatic as a face lift, injection cocktails are sufficient for patients in their 30s, 40s and 50s. To lift the upper eyelids non-surgically, Botulinum toxin is injected into the muscles that pull down the eyebrows including the corrugator supercilli muscle between the eyebrows, and the orbicularis oculi muscle at the outer tail of the brow. Injecting these muscles allows the brows to lift, opening the upper eyelids. A good injector can shape and tilt the outer brows. 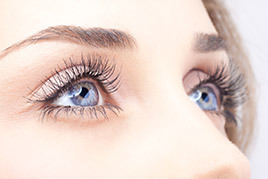 The result is a non-surgical browlift and the upper eyelids open up. 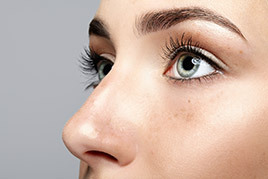 Non-surgical nose job (non-surgical rhinoplasty) is performed using injectable fillers and botulinum toxin to restore a more symmetric look to your nose. Controlled and precise injections can make the nose look more proportional and smaller in the facial frame. The results are instantaneous and there is essentially no recovery, unlike surgery. The most common filler used is Radiesse®, which is made up of calcium hydroxyl appetite crystals that are very similar to the mineral found in the bones of the nose. It is estimated that 35 million men in the United States are affected by male pattern baldness or androgenetic alopecia. “Andro” refers to the androgens (testosterone, dihydrotestosterone) necessary to produce male-pattern hair loss (MPHL). “Genetic” refers to the inherited gene necessary for MPHL to occur. In men who develop male pattern baldness, the hair loss may begin any time after puberty when blood levels of androgens rise. Dr. Jacono also uses the PRP as a hair loss preventative treatment. When injected into the scalp, PRP has shown that it will help to slow down hair loss and in many cases, stimulate hair growth in hair follicles that have begun to minimize. Fraxel laser skin resurfacing is a true breakthrough in laser technology. Until now, two varieties of laser treatment have been available for cosmetic enhancement-ablative and non-ablative. Ablative, which literally means to vaporize at a very high temperature, are very effective at destroying unwanted tissue but have significant side-effects and require a lengthy healing period. Non-ablative, on the other hand, have very few side-effects and require almost no healing time, but involve numerous treatments over many months to achieve only modest results. Dr Jacono is proud to be one of a small group of top facial plastic surgeons offering the Microneedling with PRP Facial in NYC and Long Island. This facial is a combination of two new innovations, using Micro Needling of the skin with growth factor enriched Platelet Rich Plasma (PRP). CoolSculpting is the only FDA-cleared, non-surgical fat reduction treatment that uses controlled cooling, freezing fat cells, which eliminates stubborn fat that resists all efforts through diet and exercise. The results are proven, noticeable, and lasting, so you’ll look good from every angle. CoolSculpting can reduce fat in areas such as the abdomen, flanks, and inner and outer thighs. Silhouette ThreadLift procedure is a non-surgical facelift technique that Dr. Andrew Jacono performs on patients that want to look younger with a more lifted appearance of the entire face to include the neck and brow region, without the need for surgery. Dr. Jacono is considered one of the top facial plastic surgeons in New York who specializes in this minimally invasive procedure of the face.